Quarterback Teddy Bridgewater has been placed on the Active/PUP list. Find out what this means for Bridgewater as he progresses forward in his rehab. Updated: July 26, 2017, 6:05 p.m.
Quarterback Teddy Bridgewater has been placed on the Active/PUP list. Players who are unable to start training camp with a football injury are placed on this list and can be activated when they are ready to return. Bridgewater suffered a torn ACL and dislocated knee injury on Aug. 31 of last year. He had his knee surgically repaired on Sept. 8 and has been rehabbing the injury this offseason. Bridgewater returned to the field to rehab during mini-camp and OTAs, but was not cleared to practice. GM Rick Spielman addressed the media Wednesday and said the team hadn't seen Bridgewater since he left the facility last month. "We haven't been able to see him since he's left," Spielman said. "I know he had a positive report from his surgeon." The Vikings have a looming decision at quarterback, but the resolution will likely be prolonged as Bridgewater recovers from surgery. Quarterback Sam Bradford will hold the starting duties until Bridgewater is fully healthy. After being acquired from the Eagles last September, Bradford tallied 3,877 yards, 20 touchdowns, and 5 interceptions, while posting the highest completion percentage in league history (71.6%). He will have the opportunity to lead the team under the direction of his former offensive coordinator in Philadelphia, Pat Shumur. During his first press conference at Vikings training camp, the eight-year veteran expressed his desire to lead the team. "Everything’s in front of us right now – I think an opportunity to be a great team," Bradford said. "I think we have a lot to do. I think we had a great spring, I think we kind of laid the foundation there, we need to look to build upon that." Even with the questions surrounding when Bridgewater will return, Bradford said it won't impact his approach or goals for the season. "It really doesn't change the way I approach things, obviously," he said. "My goal is to come in and get better and be the best player I can be." The timetable is unknown for Teddy Bridgewater's return, but the Vikings are not likely to rush him back from this injury. 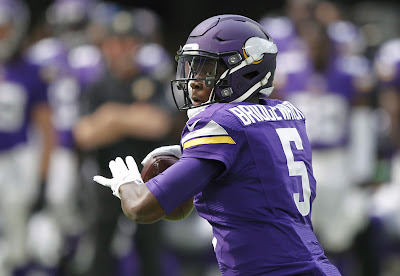 Minnesota declined Bridgewater's fifth-year option in May, but according to the collective bargaining agreement (CBA), his contract can toll into next season if he is on the PUP list through the first six games of 2017. No matter what, GM Rick Spielman noted he is happy with the Vikings' quarterback situation. "We're fortunate to have two quarterbacks like that on our roster," Spielman said. "I know Teddy and what he means to this organization and how hard he has worked in his rehab to get back on the field as quickly as he can, so I’d rather face those type of issues as we move forward." Bridgewater will address the media Thursday for the first time since he injured his knee 11 months ago.